Are you ready to see the sights and taste the flavors of Philly? Well, call us today! Flavors of Philly - What better way to start your Philadelphia foodie journey at the number one rated food tour in the area, the Flavors of Philly tour. Ran by one of the most popular tour companies in Philly all around, City Food Tours, this particular tour is fun and casual, quirky and historic. Eat iconic foods, meet local vendors making it big, and get insiders tips on the best places to go in town. You will even get a history and architecture lesson in between stops! This is the absolute perfect way to ‘Discover Philadelphia’s most popular food favorites while getting a taste of the city’s rich history and culture’. The five stops you will make are local, low key, and independently owned, really giving that extra insight into the city and its economy (plus culture!). This tour is available each Monday - Saturday from 1:30 to $ and each Sunday from 11:30 to 2. National Constitution Center - Oftentimes called America’s Town Hall, the Museum of We the People, and even the Headquarters for Civic Education, the National Constitution Center is a museum of many names. This amazingly interactive museum is dedicated to the education and history of the United States Constitution and features rare U.S artifacts and theater performances. This is the first and only institution in the country established by Congress to ‘disseminate info about the U.S constitution on a non-partisan basis’. While here, your group can take part in special themed packages, such as field trip-oriented educational courses and tours, or opt to take a guided or self-audio tour of the building. This is the perfect stop to get some exercise after your meal and see a truly iconic American institution right here in Philadelphia. Explore the exhibits, watch engaging theatrical performances, or set your sights on the original document of freedom! Reading Terminal Market - Tonight for dinner your group will head back to the Reading Terminal Market, which as you saw earlier is a massive indoor farmers market and collection of quality eateries in Philadelphia. Offering diverse food, fare, and local specialties since 1892, this Chinatown spot has a truly impressive history, including a part of the Reading Railroad Company. You can find everything to enjoy a complete meal here, from the cookbooks to fresh cut flowers for the centerpiece, or you can enjoy a meal at the market itself. The culture here is amazingly palpable, the Philly population and tourists from all across America flocking inside to taste the food of Philly.A must stop for lunch while in here is DiNic’s Pork and Beef, a Reading Terminal Market staple since 1954. While here try the famous Roast Pork and Broccoli Rabe Sandwich, voted the "Best Sandwich in America" by Travel Channel’s Adam Richman. Betsy Ross House - Welcome to the birthplace of the American Flag, the landmark Betsy Ross House in Philly right off of Arch Street. This historic home is the purported site of famous American seamstress and flagmaker, Betsy Ross. Within Philadelphia’s Historic District, this home of the American flag and amazing woman behind it provides a look at the colorful fabric of America’s rich history, literally! Get enveloped in the "sights and sounds of the 18th century" as you and your group explore the exact room in which Betsy Ross sewed the first flag in 1776. All throughout the home, you will see several different interactive and historical programs, including a new audio tour and kids audio tour options that teach you everything you need to know about the woman behind the flag! This is a quintessentially Philadelphia way to start your day! Federal Donuts - You are in for a seriously surprising treat for lunch at Federal Donuts, a newish city-wide breakfast and lunchtime staple. There are over five locations across Philadelphia, your best bet to avoid the lines probably on 2nd Street. What can only be described as "deep-fried joy," Federal Donuts sells the perfect combination of Korean-style fried chicken and delicious donuts. Yeah, you read right, fried chicken and doughnuts. This unique combination has sold out regularly since the store first opened in the fall of 2011. The owners have a definite Middle Eastern spice and taste influence, the chicken fried with Shabazz spices and the donuts mixed with the aromatic spices of Baharat. The best thing about Federal Donuts? You can have sweet as pie donuts for lunch, or maybe some spicy Korean fried chicken, it’s all up to you! Your stomach will seriously thank you for this stop! Benjamin Franklin Grave -Another chance to walk it off and see the sights, your group will discover a 295-year-old cemetery located in the heart of historic Philadelphia next. First established in 1719, this extremely historic burial ground is considered to be one of America’s most interesting colonial and revival-era graveyards. There are over 1,400 markers within the two acres of land, some of them belonging to signers of the Declaration of Independence, and of course, the grave of the famed Benjamin Franklin. Not only will you get a chance to see these famous resting places up close, you will also get to see those of countless local lawyers, leaders, parishioners, and history-makers in almost every step you take. A stroll through the Christ Church Burial Ground is a stroll through Philadelphia history itself, an absolutely amazing educational opportunity to learn the story of the many victims of Yellow Fever, colonial-era church members, and men who shaped the foundation of history for the United States. Franklin Institute - Located in Philadelphia, Pennsylvania, the Franklin Institute is a hands-on science museum with an IMAX theater and a planetarium. Your tour group will enjoy this thrilling experience. Exhibits include the sports challenge, the train factory, a full weather station, and exhibits on electricity. There are several different scientific disciplines from sports to space for the group to explore. The planetarium you’ll find here is the second oldest in North America. Founded in 1824, the Franklin Institute was built in honor of Benjamin Franklin due to his inventiveness in the field of science. In 1934, the current building was under construction and due to the Fels Planetarium being nearby, the museum became hands-on. The IMAX Theater and the Mandell Center were added in 1990. Today, this science museum is the most visited museum in Pennsylvania! Rocky Steps -The Rocky Steps are a famous landmark, located in Philadelphia, Pennsylvania. Visiting this location is a must-do for your group tour. They are located near the east entrance to the Philadelphia Art Museum. This tourist attraction is one of the most popular in the city. It takes perseverance and determination to climb to the top of these iconic steps. While at the top, the group can have a photo opportunity. After climbing the stairs, the team will enjoy the breathtaking view of the Philadelphia skyline and Benjamin Franklin Parkway. These steps are considered to be the second most famous location for filming movies in the world. Specifically, a few of the sequels of Rocky Balboa were filmed at this location. We are sure your group will be singing the theme song “Getting Strong Now,” as you climb these famous steps. While in Philadelphia, experience this thrilling triumph and remember to take in the sights that surround the location. Pats/Genos - Even after the taste of the Flavors of Philly tour we highly suggest you go back to these iconic establishments to weigh in one final time on the very best cheesesteak in town. 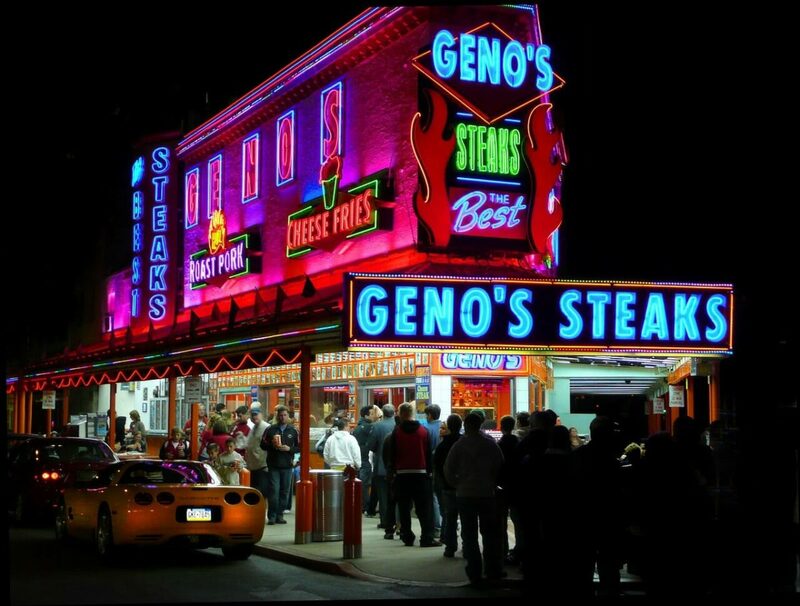 Philly is famous for cheesesteaks, and in turn for the great cheesesteak debate between two of the oldest and most popular steak eateries in town, Pat’s King of Steaks and Geno’s Steaks. This debate has been going strong for 4 decades now and has drawn tons of public attention, becoming an iconic must-stop for tourists and locals alike. At Pat’s King of Steaks, you will experience sliced meat sandwiches served quickly across the counter, wide open and ready to devour, unwrapped and messy! Pat’s boasts Cheez Whiz (don’t order a cheesesteak with onions, order a Whiz Wit, it’s all in how you say it). Geno’s Steaks serves up neatly wrapped sandwiches with thinly sliced meat and actually suggest provolone as the cheese of choice, making for very subtle, but noticeable differences between here and Pat’s. We suggest your group tries both Pat’s and Geno’s, or maybe split up and take a vote on the best sandwich afterward! Total Amish Experience - Bird in Hand -This is your group's chance to see what life, and food, was like growing up in an Amish community. See what it was like for the fictional Fisher family of the past as you explore their makeshift 9-room homestead and classroom. You will get to watch a 'compelling and emotional' retelling of the concepts toured previously in the Fisher Homestead at the theater, get free gifts pertaining to Amish living, and even eat dinner at the onsite Plain and Fancy Restaurant, a Lancaster County original family-style dining room serving up the finest Amish classics. This is your chance to taste what hundreds of thousands of other guests have left raving about with the Pennsylvania Dutch farm to table foods, served just the way Grandma Lapp did in the beginning. This entire farm and dinner tour will take your group about 5 hours.